Rowan Knitting and Crochet Magazine 58: My Favourites plus Giveaway! 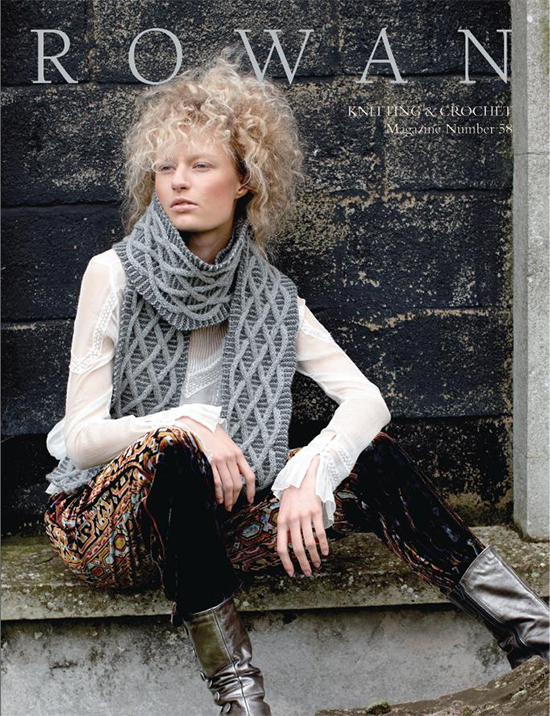 It is around this time of year that I begin to plan my winter knitting projects and can’t wait to receive my copy of the current Rowan Knitting and Crochet magazine. I love to come home to find that my postman ….well actually postwoman…. has delivered it to my door and I only open it when I have a good hour to myself to give it my undivided attention. Having received it a couple of weeks ago and studied the stylish pages from cover to cover I have listed my favourite designs here in this post. Also, towards the end of the post, I am giving you the chance to win a copy of the latest magazine from Rowan: Rowan Knitting and Crochet magazine Number 58. To reflect the approaching season’s trends Rowan divides their magazine into three stories with this time naming the trio Tranquil, Frost and, as always, Essentials. 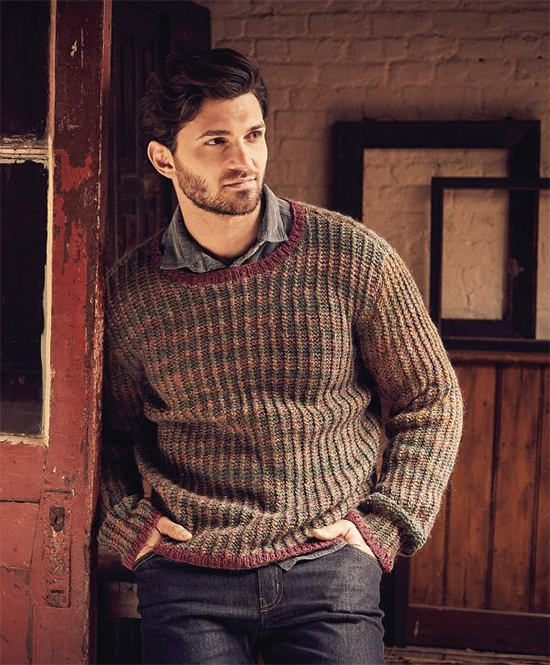 The Tranquil collection consists of colourwork based designs for both men and women using flecked, tweed or softly graduated yarns to produce a gentle muted look. Here’s some of my favourites from Tranquil. 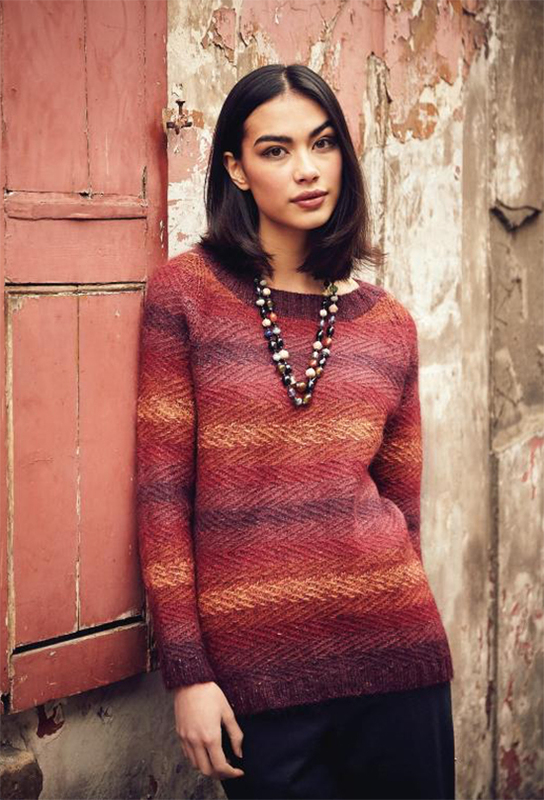 I just love the autumnal shades and textural zig-zag stitch in this simple shaped colourwork sweater designed by Gemma Atkinson. Scilly is knitted using a combination of Kidsilk Haze and Felted Tweed held together and is suitable for the more experienced knitter. Ulva is a beautiful fitted jacket designed by Lisa Richardson and knitted in Felted Tweed. This design looks more like it has been cut from a tweed-like cloth and sewn together rather than knitted with three alternating shades of yarn in moss stitch. I would like to knit this up in shades of blue and red. I wonder if the shades Watery, Tawny and Maritime would work together? I would definitely need to swatch beforehand though. 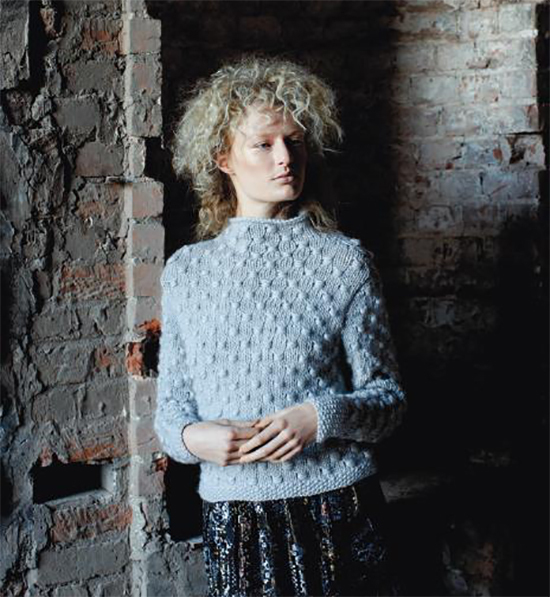 Hayling, a scoop neck sweater, designed by Martin Storey, is probably my favourite from magazine 58. Knitted in Rowan’s self striping Alpaca Colour yarn using a variety of cable stitches and a scattering of bobbles here and there. I hope I do get around to knitting this design and would probably choose a different shade such as the new one Violet. Hayling, is suitable for the more experienced knitter. A wonderful mens round neck sweater designed by Gemma Atkinson with a simple all over rib design, set-in sleeves and contrasting bands of colour at the cuffs, neckline and lower body. Knitted using Felted Tweed and Colourspun this pattern is suitable for the average knitter. This looks like a great mans sweater to me! The designs in the Frost collection are inspired by ice covered landscapes and frost encrusted foliage. Shapes are simple and unstructured, designed to be worn loose and layered on those cold winter days. I adore cardigans including this one called Frosty by one of my favourite designers, Sarah Hatton. Knitted in Felted Tweed, with a cabled yoke that is knitted sideways; I love to try knitting in all sorts of directions! Gray is not really my colour but with 28 shades to choose from in Felted Tweed I’m sure I can find one to suit.This knitting pattern is suitable for the more advanced knitter. Crisp, designed by Gemma Atkinson, is another sweater I would love to add to my winter knitting list. Knitted in a textured wrap stitch with bands of moss stitch using Cocoon and looking elegant but cuddly! This knitting pattern is suitable for the average knitter. Brisk, with it’s deep rib cowl neckline and short sleeves looks like it would be a very versatile top: wear on it’s own or layer it over a long sleeved t-shirt. Designed by Sarah Hatton using Fazed Tweed with the allover deep ribbed design worked sideways from cuff to cuff to great effect. If you haven’t tried Fazed Tweed it knits up into a wonderful soft fabric with a beautiful fluffy halo; ignore how it looks on the ball as it melds together when knitted. I think I would like to try this design in the shades Sycamore (blue-purple) or Bay (pink-white). This knitting pattern is suitable for the average knitter. Shivery caught my eye now that I have got back into crochet. Designed by Lisa Richardson using Cocoon and crocheted with a lovely textured stitch and finished with a scallop edging. Looks beautiful! This pattern is suitable for the average crocheter. This is such an elegant cardigan with it’s pretty snowflake pattern across the yoke and knitted using Kid Classic in a gorgeous winter white shade called Feather. Designed by Marie Wallin and suitable for the more experienced knitter. The Essentials section highlights the key shapes of the season. Designs are simple easy to wear styles that will compliment the season’s looks. 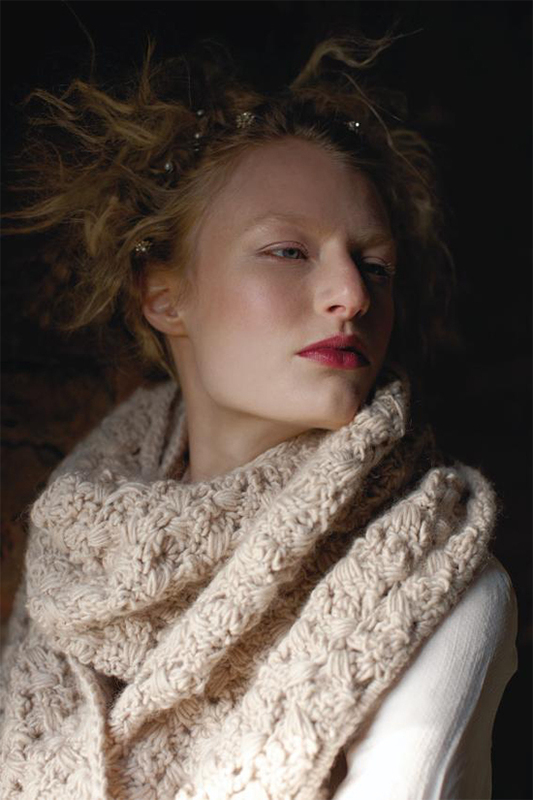 Brona, designed by Gemma Atkinson and knitted using the gorgeous soft lightweight yarn Mohair Haze. With a honeycomb effect yoke and raglan sleeves, this knitting pattern is suitable for the average knitter. What was the name of the cowl I designed in October 2014 and what yarn did I use to knit it up. Send your answer to me by clicking on the link below. The competition closes on Sunday 9 August 2015 at 1pm US Mountain Time (8pm UK Summertime). The competition is now closed. Congratulations to the winner……..Alison from Missouri. !